My son is obsessed with fresh coconuts. I am not. I do not own a machete and I am not into hacking one open. But we found one yesterday that had its top cut but it was wrapped up so we could enjoy the water inside the shell without the work! Brilliant. Anyway, my son left about 1/4 cup of the water and all of the fresh meat. I admittedly have never worked with coconut meat so I had to ask a friend for some suggestions. Coconut milk was number one but I didn’t have enough water to make milk so I decided on pudding which is one of my all time favorite categories of food in and of itself! Then I remembered a little dessert I once had at Le Pain Quotidien and was inspired to make some granola and create this parfait. It is fantastic and will definitely be on the menu next time guests come over. It is sure to impress! * I use raw vanilla powder from Sunfood. It is one of my most favorite ingredients EVER. It is pure vanilla – no alcohol, no fillers, no preservatives. Place all ingredients into the Vitamix or blender and let it rip until perfectly smooth. Refrigerate for a few hours before serving. 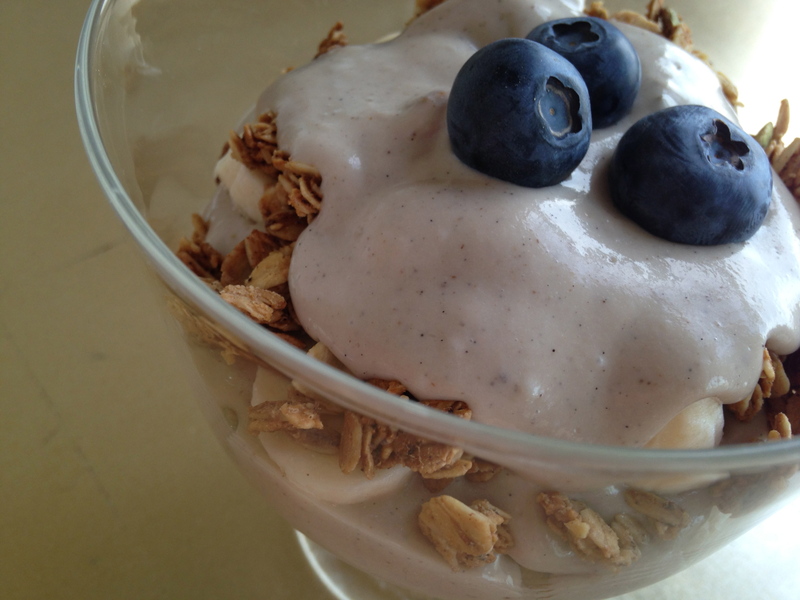 ** This makes more granola than you will need for the parfaits. Store it in an airtight container and enjoy with fresh homemade vegan milk for breakfast or a snack! ^ Use whatever flour you prefer, the idea being that it will help bind the oats together. If you don’t have flour in the house, grind up almonds or oats in the food processor. ^^ To make this oil free, omit the oil and add 2 tablespoons more of maple syrup or other liquid sweetener like coconut palm nectar. Toss all ingredients together and turn out onto a baking sheet. Bake in a 350 oven for 25 to 30 minutes until golden brown. To make the parfaits, place pudding on the bottom of a parfait cup. 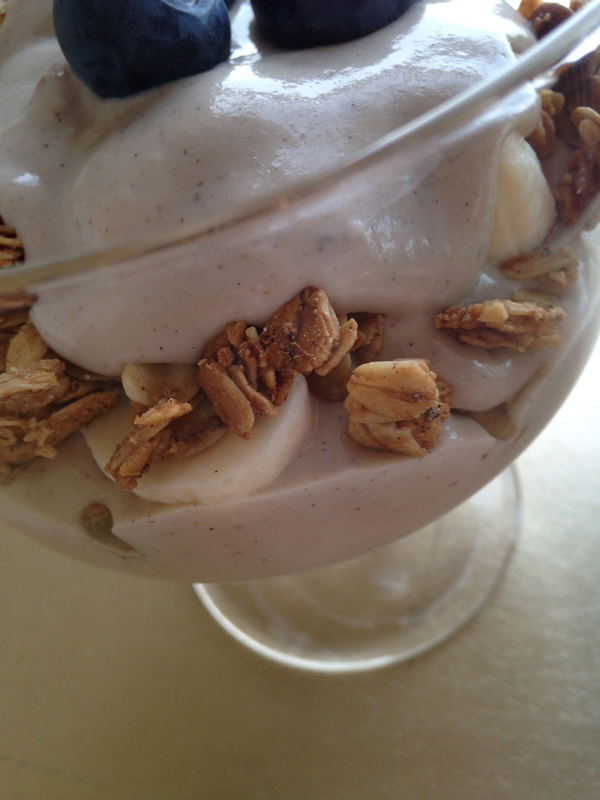 Add a layer of fresh sliced bananas and granola. Top with another layer of pudding and more bananas and granola. Then top with pudding another kind of fresh fruit like blueberries or strawberries. Enjoy!